If you think this blog is famous for my humor and wit, breathtaking photography or an occasional glimpse behind the iron curtain you’d be wrong. I am now a worldwide authority on pickled jalapenos which is now the most viewed post on this blog. The reader has spoken so I am posting another recipe which will finally propel my blog to the top of the blogging world where beautiful women who like fat guys reside and agents take numbers to offer you a book deal. 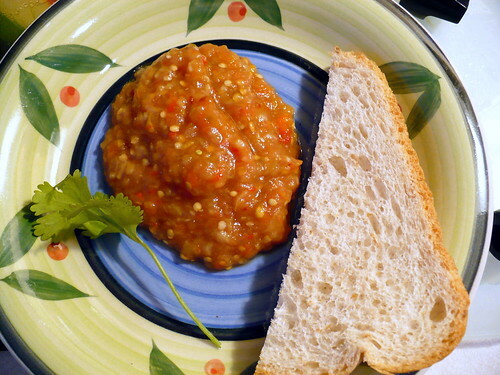 This dish is not called salsa in Russian, the actual word is “ikra” which literally means “roe” or “caviar” but if I posted something like “eggplant roe” no one would read it past the title. So “salsa” it is. As always I don’t have exact proportions and you would have to adjust it to your own taste, the problem is you don’t know what it’s supposed to taste like, so you’ll have to go with what tastes good to you. With the exception of putting too much salt, or burning your ingredients you cannot screw up this recipe. So go easy on salt and keep an eye on your oven. 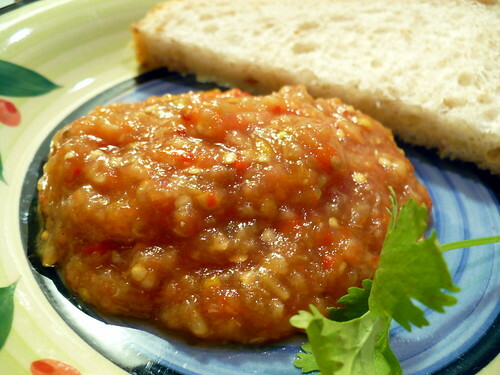 Eggplant salsa is a summer dish, it can be used as a condiment or eaten with bread, chips or by itself. In some circles the particulars of this recipe are hotly contested, I don’t claim this version to be right or wrong. I don’t want comments starting with “but my Grandma didn’t do it this way”. I may look like your Grandma, especially naked, but I draw the line at using your Grandma’s recipes. I have no idea how my own Grandma did it, and I really don’t care what yours had to say on the subject. 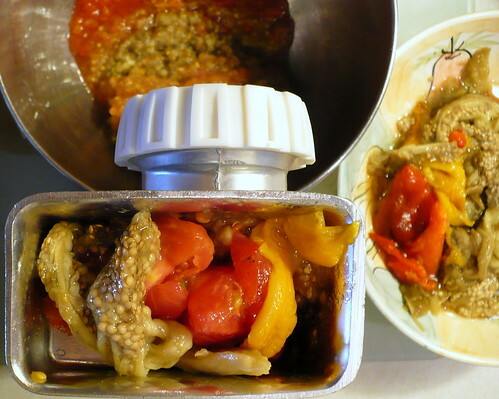 For Eggplant Salsa you will need eggplant, two make pretty good amount, use one if you don’t want too much final product. The rest of the recipe is based on two medium eggplants, figure it out. 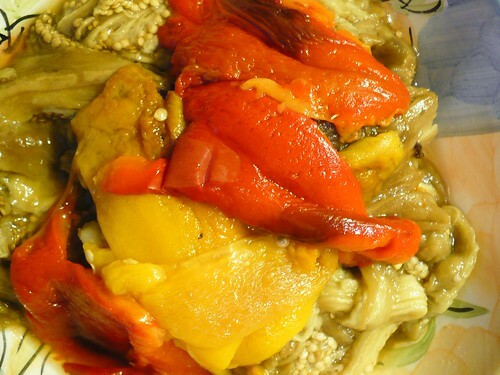 You’ll also need a couple of sweet bell peppers, 5 or so medium ripe tomatoes, about one medium head of garlic, tablespoon or two of vegetable oil, salt and pepper. 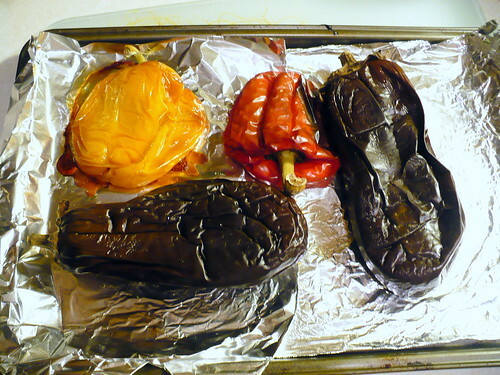 Heat the oven to 350F and place eggplants and peppers on a sheet (lined with foil if you don’t want to scrub it later) and in the oven. Every 15 minutes or so check on the condition of your vegetables and turn them 90 degrees. Some charring on the peppers is OK, skin will peel off anyway. 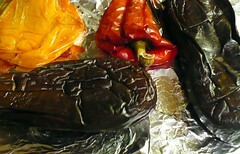 By the time they are done, eggplants and peppers will look somewhat deflated and shriveled. 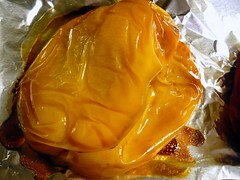 Remove from the oven, let cool to room temperature. In the meantime you can prepare tomatoes. Here is a little known secret: tomatoes are not crunchy. If you are eating a tomato and it’s crunchy, it’s probably an apple. Make sure you get some ripe tomatoes. It’s easy to peel tomatoes, just dunk them in boiling water for a few seconds, skin will peel right off. Cut them in quarters and remove the stem part. On the other hand, if you were cheap and bought a whole box of “seconds” for two bucks and they cannot easily be dunked in boiling water because of soft spots and blemishes, you’ll need to spend the next 25 minutes peeling them with the knife wishing you weren’t so cheap. Peel some garlic. Here is another tip from Cooks Illustrated which I wish I’d known 30 years ago when I was cursing my life while peeling loads of garlic: slice the clove of garlic lengthwise through the middle. The peel will just fall off. For this batch I also roasted a couple of cloves of garlic, just to be fancy. I am not even sure if I can taste it or not, but who cares, it’s all good. By this time eggplants and peppers should be cool enough to handle. Peel them too and remove seeds from peppers only. They don’t have to be pretty. The next step depends on the available equipment. Of course you can use your vintage “Made in the USA” Grind-o-Matic but in the absence of this invaluable tool-device you can use whatever else would evenly chop the ingredients. This is not a cocktail so it doesn’t need to be pulverized; it has to be the consistency of salsa. You are almost done. When all of the ingredients are processed all you have to do is add oil, salt and pepper and mix. Just like I said in the beginning, you can’t go wrong with this. Feel free to add salt, pepper and garlic to you liking. If you feel like you peeled too many tomatoes, don’t worry, grind them up; if you throw them away, next thing you know there will be some dumpster-diving “freegan” eating your stuff and your house will be declared a foraging site. There may be some liquid separating when you store your salsa. Just mix it in before you eat it. 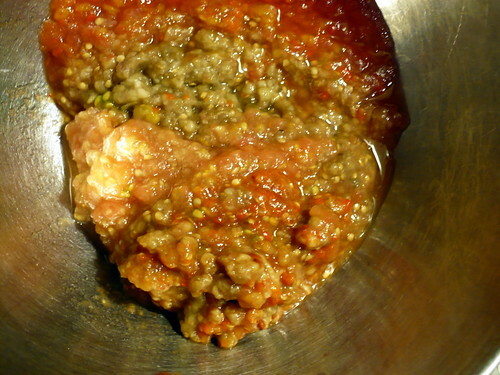 Now you are ready to enjoy your Eggplant Roe (I lied about the salsa but you wouldn’t read this otherwise). I will be here, waiting for book offers and calls from beautiful women who like fat guys.